The production process has started! First on my list was an adaptation of a really cool vintage bag I had spotted in New York a few years ago. 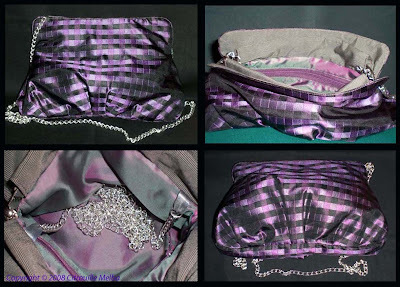 I made my version with a nice purple and black silk fabric traditionally used for the making of ties and lined with a two-tone fabric. I love it when fabric shines and shows different colours following the way you move it! I also put a nice little pocket with a zip, big enough to put a few things like a mobile phone and a lipstick for example... Knowing myself, I will quickly put too much in it! Also, it is possible to wear it across the shoulder with the chain handle, or as clutch with the chain simply tucked inside the bag. I bought the frame here again and I used this great tutorial to insert it to the bag. Ca y est, l'etape production a commence! J'avais en tete de liste une adaptation d'un super sac vintage que j'avais rapporte de New York il y a quelques annees. J'en ai fait ma version, avec un joli tissu en soie, violet et noir, un tissu qui est generalement utilise pour l confection de cravates. Pour la doublure, un tissu a reflet. J'aime beaucoup quand le tissu brille et montre des reflets differents selon son mouvement! J'ai aussi mis une mignonne petite poche a l'interieur du sac, assez grande pour pouvoir y glisser un portable et un rouge a levre par exemple... Cela dit, me connaissant, je vais en mettre trop vite fait! Ah, aussi pratique car il peut se porter en bandouliere avec la chaine, ou en pochette du soir avec la chaine rentree a l'interieur du sac, tout simplement. J'ai achete la fermeture metallique encore ici et j'ai suivi ce tutorial pour l'inserer au sac. In bocca al lupo with the production process...We want to see more very soon!!! !